Newman University offers an innovative foundation year to complement our Social Science Degrees. The Foundation Year in Social Science is the first year of an integral four-year degree, with completion of the Foundation Year leading in to the first year of the 3 year degree in Sports Development with Coaching. The foundation year enables those unable to access the traditional UCAS tariff requirements for a three year degree, an alternative route into beginning and ultimately gaining an honours degree. You apply via UCAS for the Sport Development with Coaching (with Foundation Year) course and after successfully completing the first year you will progress onto the final three years of the degree. At this point there may be the opportunity to transfer onto a related degree within the social sciences subject area. Such a transfer is subject to the agreement of the course tutor and meeting any additional entry requirements. All students apply through UCAS. Students will ideally require 48 UCAS points to access the programme. However, as all applicants will be invited to interview, there is opportunity to discuss any circumstances that may have affected the gaining of level three credits. Those with significant work and life experience of a complexity that demonstrates an aptitude to study at degree level, but with no formal qualifications, will also be favourably considered. Different degree pathway options available at the end of the foundation year may have different additional entry requirements. 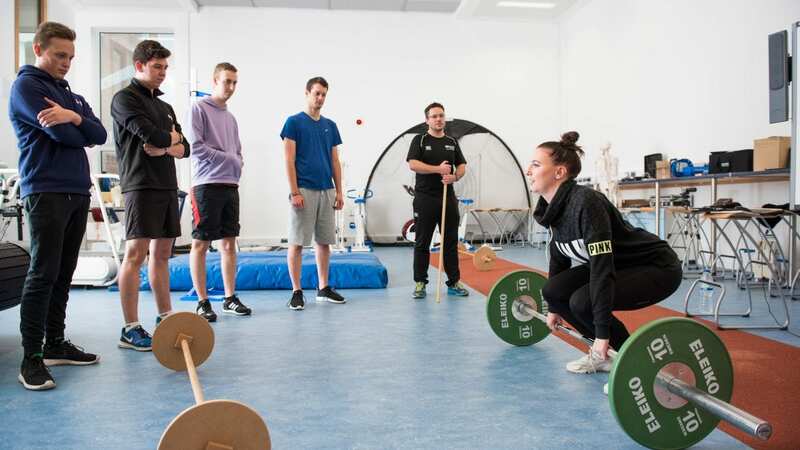 Whilst not a condition of entry onto the foundation year, students wishing to enter particular named routes will need to have met these by the time they complete the first year of this four year course – Sport Development with Coaching BA (Hons). If you require any further information or clarification of entry requirements please contact our friendly, helpful Admissions department, who will be happy to help. * Fees shown are for 2019/20 academic year. The University will review tuition fees and increase fees in line with any inflationary uplift as determined by the UK Government, if permitted by law or government policy, on enrolment and in subsequent years of your course. It is anticipated that such increases would be linked to RPI (the Retail Price Index excluding mortgage interest payments). ** Please go to the corresponding 3 year undergraduate degree page for details. A Disclosure and Barring Service (DBS) is not required for entry into this programme, although it is in many cases required by employers before students can begin their Year 2 (level 5) work placement. Find out more about completing the DBS application form and the related additional costs. For course content for years 2,3, and 4 of this course please visit the 3 year full-time degree page Sport Development With Coaching BA (Hons). This module examines what is needed to be successful in higher education, including one’s personal disposition towards learning alongside how to develop the necessary skills required to be successful in HE. It will deconstruct student’s experiences of more formal aspects of assessment such as exams, reading academically and academic writing conventions, helping them develop a plan to overcome barriers to effective engagement. It also seeks to deconstruct and reform their views on what constitutes knowledge, education and learning, drawing on theories around critical pedagogy. Enable students to understand their own journey within the structures of education and prepare effectively for further degree level study. Enable students to develop confidence, intellectual curiosity and the ability to manage their learning. Promote peer-to-peer and staff-to-student relationships that reflect those needed for success in HE. Assesse own capabilities against given criteria, take responsibility for completing tasks and seek clarification and appropriate help where needed. Take responsibility for self and others and work in a professional and ethical manner. Building on FYS001, this module continues to examine what is needed to be successful in higher education, including one’s personal disposition towards learning alongside how to develop the necessary skills required to be successful in HE. It will further deconstruct student’s experiences of more formal aspects of assessment such as exams, reading academically and academic writing conventions, helping them develop a plan to overcome barriers to effective engagement Students will further examine and challenge what universities are, who they are for, and how they are structured, with a focus on how best they can traverse the institutions systems, and where necessary challenge them. The module thus provides the opportunity to practice academic tasks that are designed to explore key university systems, processes and support mechanisms, whilst encouraging students to plan for the maintenance and development of their individual skills and abilities needed for success in Higher Education. Enable students to understand the nature of studentship, education, knowledge and learning, and apply it to their everyday lives. Enable students to understand their own journey within the structures of education and effectively prepare them for further degree level study. Analyse and relate their experiences to underlying theoretical frameworks and approaches within social sciences, carrying out appropriate research. Assesses own capabilities against given criteria, take responsibility for completing tasks and seek clarification and appropriate help where needed. This module aims to promote a philosophical way of thinking in students and as such, will cover the core of philosophy, politics, economics, sociology and psychology as well as its applications. Students will think philosophically through an examination of everyday philosophy in everyday life and how we use its languages. Politics is examined to discuss why it is often not seen as important and explores questions such as: who votes? Why not? How are decisions made and who gets to make them? What is left and right, globalisation, environmentalism and immigration? Starting with their own situations, and those of their communities, students examine how economies work and people make money or not. They will go on to explore how and why some economies boom and bust, how prices are determined, why do people earn more and why. The history of sociology as a subject, and what it is to think sociologically will be explored. Themes discussed during the module include those on what is society? What is meant by functionalism? What are conflict models and post structuralism? Issues pertinent to those in the classroom are examined and include, but are not exclusively limited to class, race, disability and gender. Psychology, its history and debates are discussed through an exploration of its different major schools including cognitive/ biological, behavioural and psycho dynamic approaches. Themes as relevant to the student body, possibly including issues such as violence, adolescence, crime, mental health, masculinity and sexuality are subsequently examined. Furthermore, some of the areas that have developed into distinct areas of social sciences, including criminology, health and social care, social policy and sports and wellbeing are debated. Support the development of student confidence, intellectual curiosity, the ability to manage their learning within the social sciences as a member of a team and autonomously. Relate their experiences to underlying theoretical frameworks and approaches within social sciences, including carrying out appropriate research. Analyse a range of social science related information using pre-defined principles, frameworks or criteria. This module asks students to undertake a practical social sciences related project. Supported through initial input and group tutorials student will go through a process. Firstly, they need to understand a community’s issues and concerns through conducting a community profile. Subsequently, they need to deconstruct the issues and attempt to find generative themes of common concern which can be seen through a social science framework. This is done via applying knowledge and theory, unpacking issues and making wider connections. Students will then need to analyse what is going on further, generating new themes, new theory and making connections. Finally, students demonstrate understanding of political and policy structures, coming up with strategies and planning for action. Enable students to manage their learning and work as a member of a team and autonomously. In this module students will investigate, and have the opportunity to make a case for the course they wish to go on to study, and how they will overcome any barriers. They will have the opportunity to undertake both desk-based research and interviews with lecturers and current students. They are expected to reflect upon their direct experiences of the teaching of at least two courses, and expose themselves to a real world experience related to their choice as negotiated with the tutors, the potential subject tutors and their study group. Students will create a poster that identifies which course they want to study, why, what the barriers may be for them, and how they are going to overcome them. Enable students to understand and articulate their intended journey within the structures of education and show how they are now prepared for degree level study. Enable student to demonstrate how they have developed confidence, intellectual curiosity and the ability to manage their learning. Enable students to show how they have adjusted to the demands of learning at HE level and can function in a modern professional environment and have acquired sufficient information and digital literacy. To enable students to demonstrate how they have developed the key transferable skills necessary for further study and employment including: the exercise of initiative and personal responsibility, decision-making, communication to multiple. Assesses own capabilities against given criteria. Take the responsibility for initiating and completing tasks and procedures, adapting own behaviour to meet obligations to others.